For today’s blog post, another chapter from my upcoming eBook. This chapter features the story of a volunteer from New Hampshire who worked to protect Grafton Pond, an area owned by the Society for the Protection of New Hampshire Forests. On an autumn Sunday afternoon, Linda Howes, a land steward with the Society for the Protection of New Hampshire Forests, welcomed me into her home, where we ate locally grown apples and talked at length about Linda’s life spent in the outdoors, her land steward work at Grafton Pond and her love of loons. While many environmental volunteers are inspired by a particular place or environmental issue, some are inspired by another person, and Linda is one such volunteer. Growing up in Massachusetts, Linda came into contact with Marion Stoddart, a fellow resident of the town of Groton who had made a huge impact on the local environment. Stoddart is credited with leading the fight to clean up the Nashua River, once listed as one of the most polluted rivers in the United States. A suburban housewife at the time, Stoddart started a movement that engaged the local community and changed the face of their river forever. Her advocacy, lobbying, petitions and mobilizing efforts were proof that one person could make a difference and an inspiration for many other everyday citizens. Passion and drive equal to Stoddart is clear in Linda, who’s filled with youthful exuberance and endless enthusiasm for the causes she cares about. Linda took her love of the outdoors and nature to college, where she majored in environmental recreation at Greenfield Community College and then at Springfield College. Working in the recreation field, as a waterfront director at a camp, she put herself through college teaching and coaching swimming. Afterwards, she found her way to a career with the U.S. National Park Service and U.S. Forest Service. Her first job, at Ten Lakes Scenic Area in Montana, took her to real wilderness, just outside of Glacier National Park and near the Canadian border. That was followed by work for the Park Service in Wyoming and then another position back in Montana. After another job took her to Acadia National Park in Maine, she ended up back in Massachusetts, working at an environmental and recreational center. After moving to New Hampshire, she says that she and her husband would camp and canoe frequently and would visit Grafton Pond, close to their home. Linda describes it as a “beautiful little place” that is “out in the middle of nowhere and there wouldn’t be very many people there.” At the same time, she couldn’t help but notice something else. “There was just so much trash, which astounded me, there was so much trash. Tires in the water and beer cans in the water, the islands were covered with trash here and there,” she says. 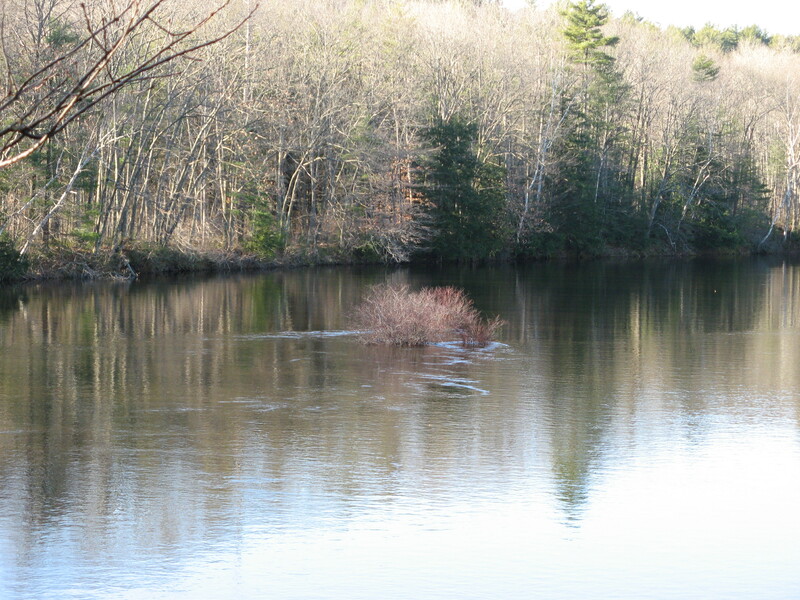 When she saw an ad in the local paper for a land steward for the Society for the Protection of New Hampshire Forests, she decided to apply, especially since Grafton Pond was one of the properties the society wanted to protect. It was twelve years ago when she first started and Linda says she spends much more time at Grafton Pond now than she used to. She attributes that, in part, to the fact that it’s a much busier place these days. Because of the increasing number of people, she worked with the Forest Society and the state to get the parking lot enlarged and improved. Linda’s efforts are assisted by the New Hampshire Lakes Association and their lake host program. She says, “They train people and they put them at boat ramps on key lakes, there’s usually a lake association that’s involved. These hosts, often its kids, college or high school kids, will be at the ramp on certain days, certain hours, and they inspect every boat that comes to put in, for invasive weeds. That’s what the program is about.” Working with residents around Grafton Pond, the Forest Society raised the money to hire lake hosts for the season. Every weekend and holiday, Linda says, the boat ramp was manned by someone from 8am to 4pm. Grafton Pond is unique from other properties of the Forest Society in two ways. First, it’s a body of water, primarily, rather than a tract of land. Also, it’s a place that is used and frequented by the public much more than other isolated properties. Linda is hopeful that visitors to the pond will take away something that makes them more careful towards and appreciative of all natural areas. “No, no, but we’ve had all kinds of stories,” she replies with a smile. Linda’s work aimed at protecting the loon population includes a number of volunteer activities with the Loon Preservation Committee. For that group, she keeps track of the loons at Grafton Pond, letting them know nesting dates, hatching dates and how many chicks have hatched. She also got to be involved in the recent effort to band the loons. “It was fascinating. We only got one pair. We were out there till two or two-thirty in the morning. They weren’t done yet and I decided it was time to go home,” she says, laughing. Linda hopes that there will always be somebody with her dedication around to protect Grafton Pond. Somebody to meet and greet visitors on weekends or every day during the busy season. Someone to look out for the place. “That’s a lot of hours,” I state the obvious. “Yeah, it’s like a full time job. Our total number of boat surveys was over 2900. You know, the little lake here in town that you came by, they have a lake host. They’re lucky if they do like sixteen boat surveys all summer long,” she says. Checking boats that come to put in at Grafton Pond has been one of the most important opportunities for Linda and the lake hosts to teach and show people how they can better respect the natural environment she loves.